Have you phoned your fridge today? Fine: you can catch up with some reading. You use your palmtop's connection to LHRnet to start a file download, saving it to the notebook PC that's still in your brief- case. It's usually part of your Personal Area Network (PAN) or piconet, but since all connections are wireless, you don't need-to dig it out and plug it in. As you enter the lounge, someone rings the doorbell back at your house. Your palmtop screen opens at your home web page, showing the image from the security camera over the door. It's the milkman. Time to open a voice connection. Your fridge hasn't paid the bill in full. "Sorry, I can't come to the door right now," you say. "Catch me next-week and we'll sort it out." Perhaps you forgot to check in a delivery of eggs, yoghurt or milk. There's a barcode scanner on the fridge door, so it's not hard to do. Better check the fridge's web page and see what's been used during the past week. And while you're at it, you may as well see what the fridge has decided to order from the supermarket. Science fiction? All of this is already possible. Electrolux has demonstrated a net-connected fridge, Bang & Olufsen is working on the hi-fi, and Merloni on the washing machine. Mobile phones are already being used to check bank accounts and buy things from vending machines in Finland. Bar code readers are being used to scan and order groceries from supermarkets in the UK. In the next five or 10 years, this kind of thing should become common. Computer companies like Hewlett-Packard, IBM and Novell.call it "pervasive computing" .. We're already familiar with the idea of "pervasive telephony", which means people can send and receive phone calls almost anywhere, instead of being limited by the range of a box on the end of a bit of electrical string. Pervasive computing extends the same idea to the web. 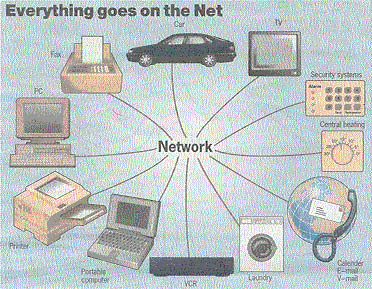 Wireless communications will provide instant access to a universal "webtop' that can be linked to almost anything. .. computer chips are now small and cheap enough to be embedded in appliances rather than used as general-purpose systems. Just as nobody worries`about how many motors they own (in washing machines, vacuum Cleaners, VCRs etc), people won't about how many computers they own. At the moment, the web mainly connects desktop and notebook computers with "hosts" or servers that store information. But it's rapidly being extended to handheld computers, mobile phones and other WIDs (wireless information devices). TV sets, games consoles, VCRs, cameras and other electronics products are next, followed by "white goods" such as fridges, toasters, and washing machines. .. Vint Cerf, the 'father of the internet' and the senior vice president responsible for US phone company MCI's internet backbone .. told an internet executive summit [last year, that] they were testing an addressing system with enough space "to let every electron have its own web page if it wants to". Cerf said: "I think that the chips to do internet protocol [communications] will be cheap enough by 2005 that we will put them in light sockets. And when we turn the lights off and on, instead of interrupting the current, we'll actually be sending little internet packets to the light bulb telling it to turn off and turn on. ..
Cerf also suggested that internet-enabled bathroom scales and other devices could automatically update your doctor's computer with your weight and other data that would enable it monitor your health. One possible downside, he joked, is that your doctor's computer might instruct your refrigerator's computer to not open its door when it puts you on a diet. There is more in this article, particularly a description of 'Bluetooth' - the "wireless wire" - a 'royalty- free-radio frequency (R-F) networking system. .. It has a range of about 10cm. to 10m, which can be extended to 100m by using a more powerful transmitter. .. The prototype Bluetooth module measures only 17mm by 33 mim, with radio transceiver chips like Ericsson's PBA 313 01/2 down to 10.2mm by 14.0mm.. The price will depend mainly on volume, and modules will be manufactured in millions." As an example of what may be possible: 'Nicholas Negroponte, founder of the Media Lab at the Massachusetts Institute of Technology, reckons "there will be more Barbie dolls connected to the internet in five years than there will be Americans. This changes electronic commerce. There'll be Barbie dolls calling up to order a dress." Schofield suggests: "If the pace of change continues to accelerate, then by 2005. pervasive computing should be, well, pervasive." Mark Weiser - "Xerox PARC’s apostle of calm discusses the vision of ubiquitous computing"
www.mobilexplorer.com - mobileXplorer.com is the first in a series of Xplorer.com Web sites that will spotlight groundbreaking technologies. "Cars that phone home, walls that move and fabrics that make us run faster: technology is about to change the way we live. As London focuses on innovation, with the opening of 100% Design and London Fashion Week, we offer a glimpse into the future..."
"Now they're cute and cuddly and live inside your computer. But, writes Jack Schofield, the rise of the robots could have serious consequences for us all"
"Michael Brooks meets research director Karl Kummerle and tries on a computer for size"
"Imagine the power of 100 mainframe computers in a device no bigger than a grain of dust. Or a machine so small that it could be inserted into the seam of your shirt yet work at 100bn times the speed of the fastest of today's PCs."